A Trip to China | reading interrupted. Sitting in my cold, dark house (I was without electricity and heating for almost two weeks), his words reminded me why I had included books in my hurricane emergency kit. This entry was posted in authors, artists, and dogs, books and reading, reading, silently and aloud and tagged books, China in 10 Words, Hurricane Sandy, reading, Yu Hua by Letizia. Bookmark the permalink. Glad to read you again Letizia. Hope you’re doing well… and that everything’s back to ‘normal’ after the hurricane. What a great post, Letizia. I still remember the trips I took as a young boy– all through reading. I am happy things are returning to normal for you and the area. My wife and I went through flooding last year and I still think about it when it rains. It’s true, reading makes for such wonderful travel, doesn’t it? I remember the photo of the huge water containers you put on your blog a little while ago. You live in a part of the world that sees more extreme conditions than I do I think – either getting too much water at once or not enough! Oh, dear. Another book to add to my reading list. Thanks Letizia. Happy Thanksgiving from San Diego. I think you’ll like it – Happy Thanksgiving to the whole family! For some reason, I can’t find the right time to read “The Road”. It never feels like the “right” moment and another book always beckons instead. I know the time will eventually come, it always does with a book like that; it’s funny how these things happen with certain books. I’d love to hear your thoughts on the book when you do end up reading it. They do become part of us and that is why I am scared of reading books. I read The Fountainhead and The Atlas Shrugged in first year of college and failed a couple of my favourite courses. I do not regret what happened but what I do know is that when reads something intently or even listens to someone with guards down, amazing things can happen. It’s quite beautiful that one can be so taken in with a book. A wonderful tribute to an author’s words! Well said!! I, too, have developed a interest in China – a vast territory…I just picked up “Mao’s Last Dancer,” I will be looking forward to reading your thoughts on” China in 10Words. wonderful to hear that you are safe. I really liked the movie “Mao’s Last Dancer” (or maybe you were referring to a book with the same title?). I learned a lot about China from “China in 10 Words” – of course it’s just one man’s point of view, but a fascinating take nonetheless. I didn’t know it was a movie – I have the book. I will check out “China in 10 Words.” I live in Vancouver, Canada where Dr. Sun Yat Sen has iconic status. He was absolutely amazing. He died in 1925 and was buried in Nanking. I was reading a biography of Pearl Buck who gave an account of his funeral. A nation mourned. It would have been interesting to see how he would have negotiated the transition. Enjoy every one of your posts!!!! Buck’s account of the funeral must be quite interesting. I will look for the book , Mao’s last dancer, as I’m quite curious now! I have now added your books to my list. Often in troubled times being transported to a different setting through literature helps us bear up. Am glad you are experiencing a semblance of normal. Catching up on blogs is everyone’s dilemma, regardless of circumstances. I hope you’ll like “China in 10 Words” – let me know if you get a chance to read it. Some chapters touched me more than others, but I found them all quite interesting. There were so many passages in the ‘Reading” chapter that I could have used – he has a great way of explaining the reading experience in such a simple manner. (and the translator obviously does a great job too!). I definitely can sense in your writing a great love for reading, a great respect for literature. It really comes across. Welcome back! I have missed you more than clogs, ferrets, rainbows, ox bow rivers and the moon. So quite a lot then. Fantastic post, China in Ten Words, duely added to the wishlist. Hi Letizia, great to have you back blogging again. I have added China in Ten Words to my reading list – sounds fascinating, thanks. That’s so cool, thank you 🙂 I have been humming Ring of Fire ever since I wrote that post! I absolutely love that passage you quoted. Thanks; all is well now. I loved that passage too – that chapter was a real gem! Love the quote! Reading has been one of the greatest gifts and joy in my life. You were smart to include books in your kit. My better half makes fun of me all of the time, because even when we are running a quick errand, I grab a book. You never know what will happen and I hate being bored. You are so right to bring a book with you wherever you go; you never know! They turn waiting for a friend or sitting in a doctor’s office into wonderful adventures. Nice words, Letiza! Hope you made it through hurricane Sandy okay! And boy, a week without electricity? The generation nowadays would rip off their hair if something like this happened to them! Anyways, awesome piece, and GREAT passage – sent a shiver down my spine. Sounds like a good book and a perfect pick for your Hurricane Emergency Kit. I’m glad things are back to normal (or at least are getting back to normal) and that you can enjoy reading with better lighting now. Yes, things are all normal now! It was a great read- being a lover of traveling too, I think you might like it. Thank you so much! I’ve stopped accepting and writing about awards but I do very much appreciate the nomination (blush) and can’t wait to read your post! Very nice post. I love it when a writer creates a world for me so rich that it comes to life. A Hundred Years of Solitude does that for me every time I read it and that reminds me, perhaps it’s time to read it again. Hope things are back to normal after Sandy. I agree, Garcia Marquez is able to create a world you can really get lost in. Now, I feel like rereading it too! I love that Letizia took a trip to China via a book. What a fabulous way to be global from home. 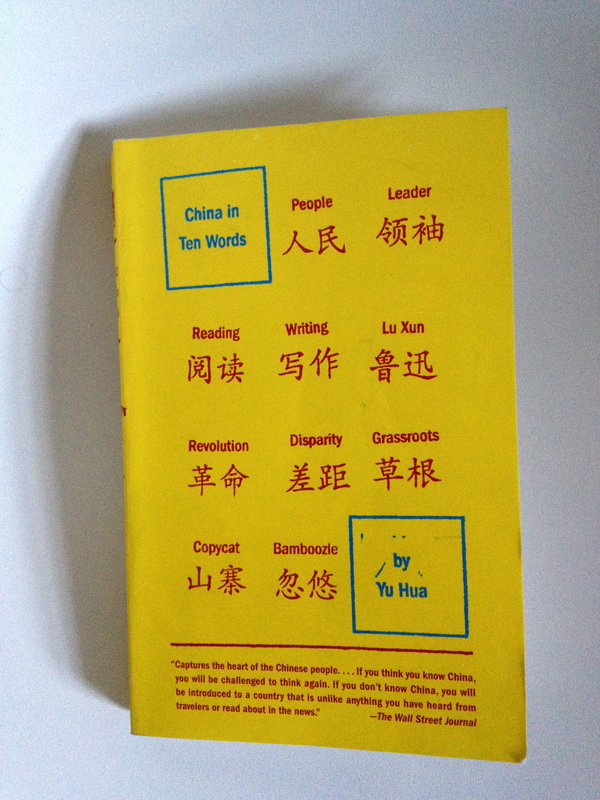 Check out her review on China in Ten Words by Yu Hua. Glad you are well and recovering from the hurricane! This post was right up my alley. I’ll have to add this book to my list. I’m sure you’ll like it (fits in perfectly with your birthday reading list!). I wonder what post-Sandy life would be like for you. You know, when the lights come back on. You might want to turn them back off again. And read. I nominated you for an award. Plz check my page for it. Thanks, Manu, that’s very sweet of you. I look forward to checking out your post! So interesting, isn’t it? Some chapters really had me captivated. I’m looking forward to reading his other works now! Thank You presenting again interesting books. It’s an interesting book; worth reading.